The Colombo Dance Platform 2016 titled Shakti: A Space for the Single Body took place on the 30th September, 1st October, 8th and 9th October. Initiated, funded and presented by the Goethe-Institut and curated by Venuri Perera, the 4th edition of the platform offered a space for artists, audiences and critics in Sri Lanka to contextualize where we are with contemporary dance, in relation to regional contemporary dance scenes.
. It endeavored to expose young dance makers and performing arts students in Sri Lanka to global trends and discoursed in contemporary experimental performing arts and asked important questions about the future. ‘Shakti’, - the primordial divine feminine energy, - underpins the curatorial concept of this year’s platform. The platform throws a focus on ‘solo’ work showcasing exciting young international and local artists, through whom we are invited to broaden our imaginations on the idea of ‘dance’ and ‘female’. The programme includes innovative, engaging performances which use dance, theatrical forms, performance art and screenings of films which challenge mainstream cultural formats. The curator of this year’s platform, local contemporary dance artist Venuri Perera has performed her solo and live art works in acclaimed festivals in Europe, and South and East Asia and is part of an international independent dance scene. She assisted International Curators Tang Fu Kuen and Ong Keng Sen in the first two editions of the platform and is on the Dance Panel of the Arts Council of Sri Lanka. German-based Swiss choreographer Lea Moro who is in Sri Lanka to begin a collaborative work with Venuri Perera, will be the opening act of the platform with ‘Sacre Du Printemps - A Ballet for a Single Body.’ Her visit is supported by Swiss Prohelvitia, The Swiss Embassy along with the Goethe-Institut. 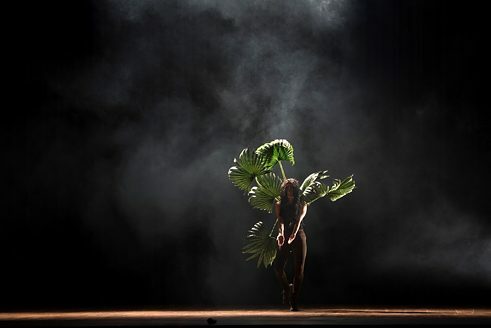 Cambodian dancer and choreographer Chey Chankethya’s ‘My Mothers and I’ explores the relationships between three women to create a dialogue on the tension between individualism and conformity in politically oppressive societies. Bangalorean dancer-choreographer Mirra, explores ideas such as power and mass hypnosis through frame works of representation, sensationalism and objectification in the media. Delhi-based theatre-maker Mallika Taneja’s ‘Be Careful’ confronts the unfortunate conflation between the manner in which women dress and the atrocities committed against them. Singaporean sound performance artist Tara Transitory’s work plays with the ideas of frequencies, ritual, noise and the collective trance. Also featured are Sri Lankan-German choreographer Sarah Mikolai, Sri Lankan dancer-choreographer Pradeep Gunaratne and Performance Artist Janani Cooray. The solo works range from short to full-length pieces, and will be performed both on stage, and in intimate settings. Each evening, discussions with the artists will follow the performances, covering topics such as dramaturgy in dance, solo practice, the woman artist, gender in performance. Writer and dramaturg Sunila Galappatti, performing artists Jake Oorloff and Subha Wijesiriwardena will lead some of these discussions, which audiences are invited to participate in. The dance film segment will feature short films by artist from South Korea, India, Australia and Sri Lankan Diaspora. In order to ensure the involvement of the next generation of performing artists, the CDP 2016 has invited the University of Visual and Performing Arts, Colombo to be a partner. The majority of events and performances will be held within the university premises, thereby inviting students of the performing arts, not only from within Colombo, but from around the island, to actively participate, open discussions about future works and collaborations, and be inspired at Shakti : A Space for the Single Body.